Students practice using figurative language by writing poetry about different spring things! 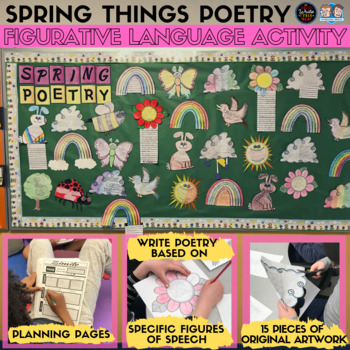 This goes beyond just writing figurative language statements; instead it requires students to use critical thinking and creative writing skills to write poetry focusing on a specific type of figurative language. This was created with middle schoolers in mind and encourages them to think deeply about things they may not have before! My own 6th graders had a blast doing this activity and it's a great break from test prep (while sneakily being test prep). 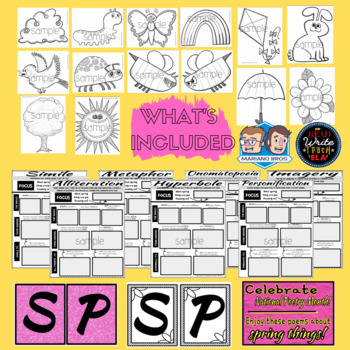 - Seven (7) planning worksheets. Students choose a spring thing to focus on. Here, they plan how to write a poem using a specific chosen figurative language. (A Google Form and paper survey is provided to survey students prior to lesson for their choices). - 15 original pieces of artwork by Mark Mariano. These spring things are what students choose to write their poems about. - Color and black and white bulletin board letters for printing.